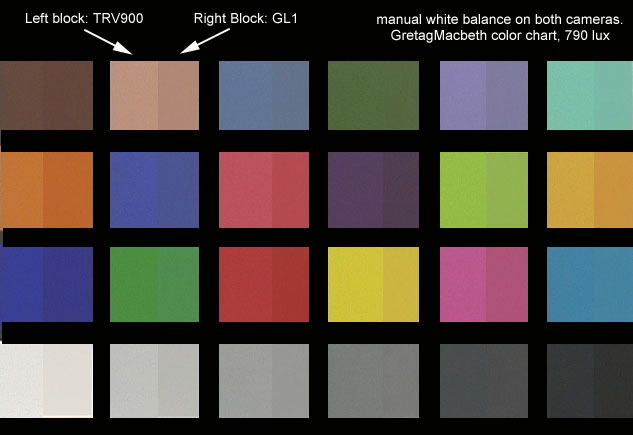 I used the GretagMacbethTM ColorChecker standard color chart to compare the color rendition and light sensitivity of the Canon GL1 and Sony TRV900 cameras. 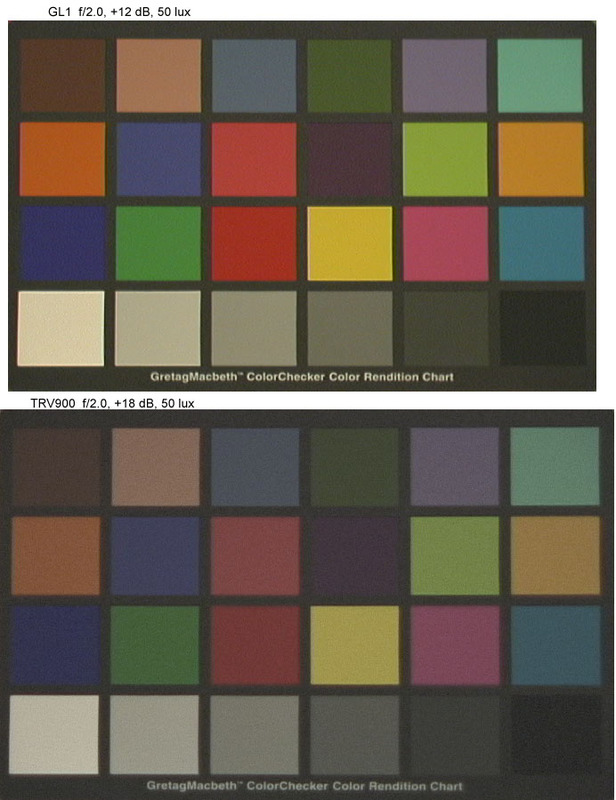 In the first test (image above and first image below), the cameras were mounted alternately on tripods in the same position, 5 feet from the chart, manually color balanced on the same white piece of paper, and set to the aperture that would just barely not allow the zebra bars to appear on the brightest square ("white" color in lower-left square). Both cameras were in interlaced video mode. Video was recorded to tape, extracted via firewire as a full frame and combined and cropped in Photoshop for the images you see here. 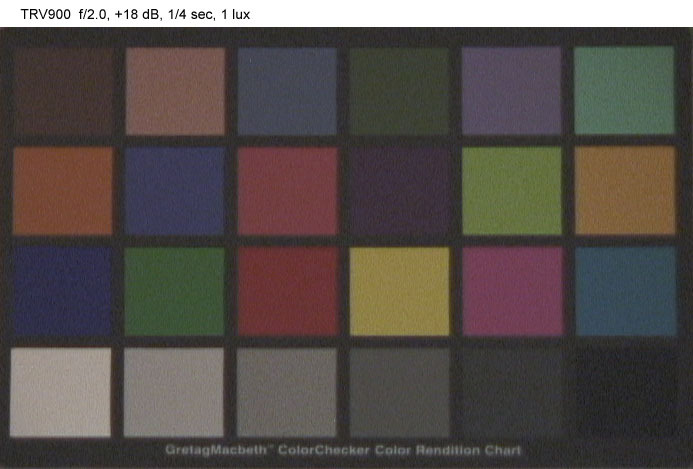 The image above shows a split field on each of the 24 color squares, with the image from the TRV900 at left and GL1 at right. 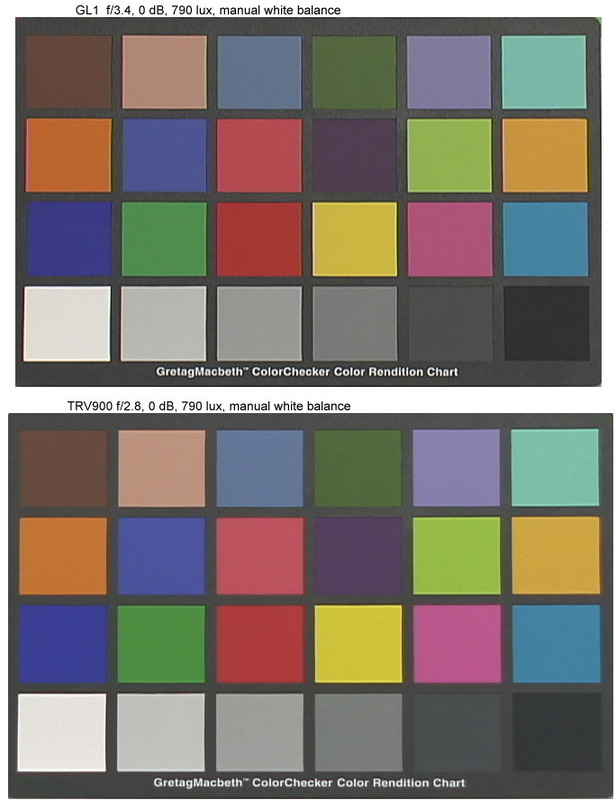 When the white balance is set manually, the two cameras will color-match well. The main tonal difference here seems to be brightness, as I did not match the exposure exactly. All the images below have no processing except as noted (first 1 lux set), and are 1/60 sec. exposure (except for 2nd 1 lux image). 790 lux case: illumination was from one 500W halogen floodlight, 6 feet from the chart. Intensity at the chart was measured with the Sekonic L-508 meter in incident mode as EV8.3 or 790 lux. GL1: f/3.4, 0dB. TRV900: f/2.8, 0 dB. Saturation on most colors is very closely matched between the two cameras on most colors (within 1%) as measured with the photoshop eyedropper in 5x5 average mode. The GL1 is 3% more saturated on red, and the TRV900 is 4% more saturated on blue and 13% more saturated on yellow. These differences may be hard to see, depending on your monitor. 50 Lux case: illumination from one 500W halogen floodlight, aimed backwards at the ceiling for reflected light. Intensity at the chart was measured with the Sekonic L-508 meter in incident mode as EV4.3 or 50 lux. Color balance was not reset from the previous case; apparently this ceiling is slightly more yellow than true white. 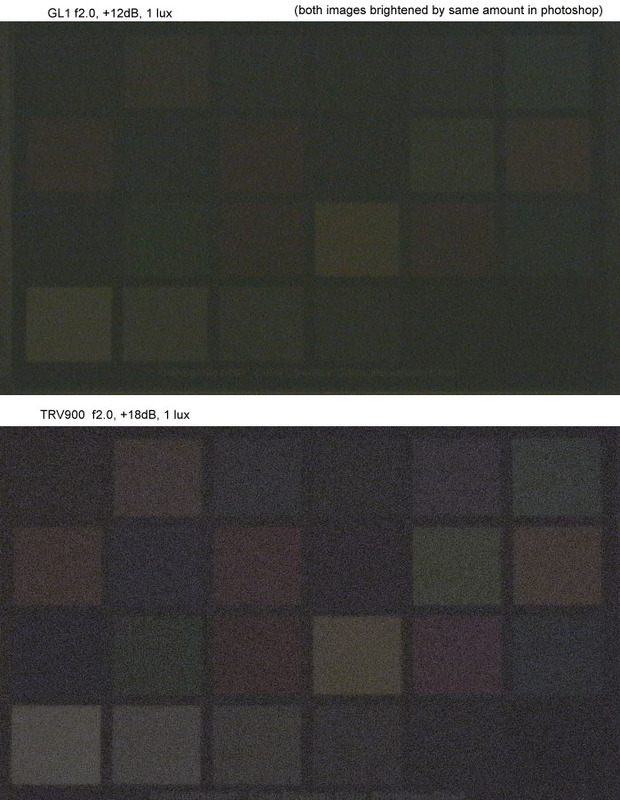 The TRV900 at f/2.0, +18 dB is still not quite as bright as the GL1 at f/2.0, +12 dB, and the TRV900 image is more noisy and has noticibly less color saturation. 1 Lux case: illumination from an incandescent source in a different room; diffuse illumination only. Intensity at the chart, -1.1 EV or 1 lux. Color balance not reset. Both images were brightened by the same amount in Photoshop to show the colors more clearly. The TRV900 is brighter but more noisy. GL1: f/2.0, +12 dB, TRV900: f/2.0, +18 dB. 1 Lux case, 1/4 second exposure. Only the TRV900 has the option to use shutter speeds below 1/60 second. The image is noisy, but bright enough for a useful image in this very low light level (not enough to read by). TRV900: f/2.0, +18 dB, 1/4 second.